German Apple site fscklog.com got their hands on a blurrycam shot of the new MacBook Pro specs. 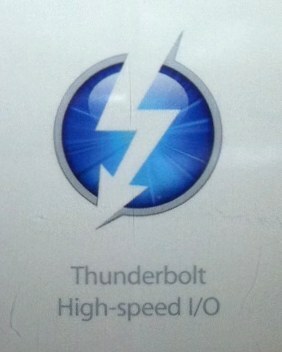 Most notable is that the new Light Peak port will be called ‘Thunderbolt’ with the logo below. New Core would allow the Sandy Bridge i5, the 1333 RAM, Intel HD 3000 graphics, the FaceTime HD camera (but just as the current iSight accordingly could exact), the Thunderbolt connection for new adapters joys and the XC on SD slot – all other specs listed are unchanged. So Intel HD 3000 Graphics, SDXC slot (with Cards that go up to 2TB and beyond), “FaceTimeHD” and otherwise pretty normal on the low end.